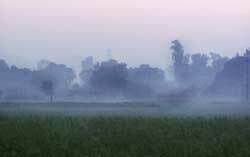 farms in the terai region of Uttar Pradesh were enveloped by fog this August. Fog is not unusual in this part of the country but it usually starts happening in winter, mostly in late December and January. Experts at the India Meteorological Department (imd) are unclear about the factors that led to the August-fog. Though there is no scientific proof, they attribute this phenomenon to increased availability of surface water and increased day temperatures. Waterlogging from irrigation canals and embankments and indiscriminate pumping of groundwater leads to more evaporation, and consequently more humidity. Incidentally, this phenomenon coincides with the time of paddy cultivation. The humidity is highest in July and August and lowest in February. How does increased temperature and humidity cause fog? The heat from the earth is radiated out to space after the sun settles. The warm and humid air moves up.At the same time colder air from the Himalayan side sweeps the region and does not allow the warmer air to move up. When the air above is cooled to below dew point, condensation takes place, forming fog. Usually a blanket of clouds will trap the earth's heat and prevent fog. But this rainy season, with no clouds and rain, the situation was worse. But scientists are unclear if the phenomenon can be attributed to global warming. The changing climatic variables that have a bearing on the fog are still unclear to scientists. "I do not think that moisture from waterlogging or irrigation water is linked to untimely fog formation," says R K Verma at imd's meteorological centre in Lucknow. Air pollution in the region has a major role to play in fog formation -- one important aspect is rural air pollution, says Verma. This untimely fog has been of great bother to the farmers. According to them, this condition is ruining their paddy crops. "First there was no rain, and then when we somehow managed groundwater, the fog wasted all our efforts," says Rajinder Prasad Maurya, a farmer of Patkhalia village in Sant Kabir Nagar, Uttar Pradesh.